From Blues to Smiles to Joy is now available at: www.amazon.com/dp/B00OSBLSIK Spread the word! 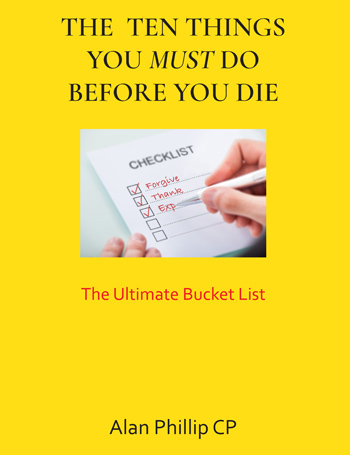 The Ten Things You Must Do Before You Die is now available at: www.amazon.com/dp/B00OSBLSIK Spread the word! Have you ever wondered how to be happy? A dictionary is a helpful tool. It can give you definitions. But it can't give you solutions. For instance, a dictionary can tell you what is happiness. But it can't tell you where to find it. A dictionary can tell you what is joy, but it can't tell you how to smile. A dictionary can tell you what is depression. It can list the symptoms of depression. But it can't give you a cure. A dictionary can tell you what is anxiety or what is fatigue, but it can't give you solutions. A dictionary simply defines terms. My Book points the way. Many people will tell you they are experiencing sadness and even depression and are searching for ways to find joy. But what they are really saying is "Help me find friends." My book points the way. The challenge of coping with everyday depression and finding happiness may seem complex. My book that clears the air and shows simple and practical steps to find true and lasting joy, joy, joy. Although my book does not deal with serious chronic depression as such, many chapters offer a blueprint that can help anyone have a better day, no matter what their problems are. Written in an easy style with beautiful photos and happy quotes, this book will help you find your smile. It will also answer the question, "How do you help a depressed friend?" This book makes a great gift! This book has 30 chapters. You will learn 30 ways to cope with everyday depression, and journey through smiles into joy! "Father Alan Phillip, C.P., describes FBSJ as a "tapestry," and that it is. Thirty brief chapters are full of wit, advice, and compassion that connect with quotes from the Bible, countless books and websites. Most of all, the pages are full of engaging common-sense snipets of wisdom that will cheer us all up and also make us think. With their fresh and honest style, the chapters are rooted in the author's many years of pastoral care, providing the backdrop for insightful discussions in chapters entitled, variously, Manage Anger, Conquer Fear, Handle Grief, Nurture Your Soul, Take Control and Understand Suffering. The work is rich in the lessons that are rooted in the basic goodness of human beings and our capacity to grow. Whether you are content to read one or two chapters in a short time or take a full day and try to digest it all, you will be rewarded with food for thought that you can savor. The work is engaging and well-written throughout, and is a book to keep." _____ I eat a balanced diet. _____ I exercise. _____ I get enough sleep. _____ I play. _____ I get plenty of light. 2) ______ I accept the reality of daily troubles. 3) ______ I take charge of my thoughts. ______ I focus on positive thoughts. 4) ______ I talk to someone when I am down. 5) ______ I listen to others. 6) ______ I manage my anger. 7) ______ I conquer my fear. 8) ______ I accept the truth of who I am. ______ I speak the truth at all times. 9) ______ I learn from life. 10) _____ I handle criticism leveled at me. _____ I criticize carefully, and only if necessary. 11) _____ I handle grief. 12) _____ I forgive others. 13) _____ I make firm commitments. 14) _____ I am constantly growing in knowledge. _____ I read and keep informed. _____ I converse with intelligent people. 16) _____ I focus my concern on others. _____ I make others laugh. 20) _____ I keep money in perspective. 21) _____ I am grateful. 22) _____ I am a good friend. 23) _____ I am disciplined. 24) _____ I take time to R & R.
25) _____ I believe some good will come from my suffering. 26) _____ I use words to build up and not tear down. 27) _____ I care for our planet. 28) _____ I believe I am loved by God. 29) _____ I believe in life after death. _____ I believe I am forgiven. 30) _____ I pray for everyone. National Suicide Prevention Lifeline: 1-800-273-8255. “This is a book for all mortals. It will help the young, the middle aged and the elderly find peace with what we all realize is inevitable. None of us knows when our time will come. We hope to live a long life, but death may come at any time. A heart attack, an accident, an act of terrorism, or a natural disaster may suddenly claim us. What do we need to do to be prepared? Are you a parent concerned that your older children are not going to Sunday Mass? Are you a teacher looking for a good resource that explains the Mass? Are you a participant in the RCIA and want to learn more about the Mass? Are you a teen wondering why you are supposed to go to Mass? Do you go to Mass only at Christmas and Easter? Are you a non-Catholic seeking understanding of your spouse's Catholic faith? Are you looking for a richer spiritual life? "Through this book I've come to realize the true meaning of Mass, and how it carries the true message of God's love, compassion and mercy. All through my youth I saw Mass as a chore. Later, I went and tried to connect with God. It didn't work. I didn't know what I was looking for. I stopped attending. After five years, I read this book and truly understand the message that Mass conveys and how it carries over to my life throughout the week. I found insight to appreciate Mass and carry God's message in my daily life." Perhaps you thought that participation in Sunday Mass took only about an hour or so. My book explains how participation in Mass is a way of life. What we do at Mass is intended to form and shape our thoughts, words and actions all day, everyday, all week long, all year long, and all life long. The chapter titles list the ten steps that our hearts take on the journey to joy. To buy a copy of the printed book, go to Amazon.com. Also recommended on Amazon: Understanding Catholic Worship, by Judy Bullock. 4) Videos or listen/download audio podcasts. I invite you to click on and play one of the two videos available on this website for a brief overview of these topics. Although the locations are different, the talks are essentially the same and about twenty-five minutes in length. You may want to play a section at one time, have a discussion, and then go on to play the rest. In Chapter 6 of the book I mention how photography changed the way I see the world. Over the years I have managed to capture some very beautiful photos of God's creation. Click here to view photos . You may duplicate these as often as you wish for your personal use. They look great on classroom bulletin boards, refrigerator doors, etc. And framed, they make nice gifts. I use many of these photos to make greeting cards. These articles are copyrighted, but you are free to duplicate them, email them, etc., for non-commercial purposes. Some are suitable for classroom use. Others are more appropriate for spiritual reading. You may wish to discuss some of them around the dinner table. The article, How to Handle Criticism, I recommend for everyone who is engaged in ministry in their parish. I wish the Peace Interview would be acted out on national TV. And as a Passionist, I hope everyone reads the first article, A Story About Us. Part of the ministry of a priest is to build community, to bring people together in a spirit of love. The late comedian Victor Borge once said, "Humor is the shortest distance between people." With that in mind, I try to begin my Sunday homilies with a joke. It not only gets people laughing, but it also wakes up the preacher! I want to share with all of you who visit this website some of the better jokes I have found in recent years. Most of these have gotten good laughs, some guffaws, and of course a few groans. So when you click on the 'Homilies' link above, you will find a joke next to the homily. Enjoy, and share these when you can." Finally, please tell your family, your friends and everyone you can about this website and about the above mentioned books and features. Thank you very much. I wish you a great day and a joyful life! © 2019, Fr. Alan Phillip, C.P.. All rights reserved.